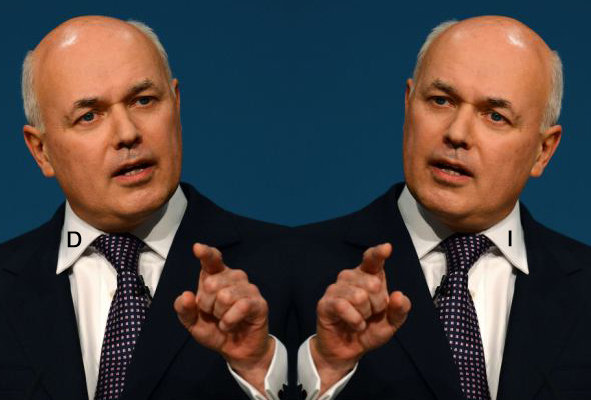 The vile twins, Iain and Duncan Smith, are facing being taken to court by the European Commission for another aspect of their Nasty Party regime. An extra residency test, applied by the UK government, is to be challenged in the European court. It is applied to see if migrants are eligible to make a claim but may breach EU law. There is already an EU standard test but the British right-to-reside test goes further than this and restricts access to a number of social security benefits. These would normally be available to those coming to the UK from another EU member state. The Work and Pensions Secretaries Iain and Duncan Smith accused the commission of trying to “water down” measures to protect hard-working British taxpayers. We are confident that, as men of honour, they will both make this a resignation issue: please. This entry was posted in Comment, Legal, Loathsome, News, Politics, Society and tagged Department for Work and Pensions, European Commission, European Union, European Union law, iain duncan smith, IDS, nasty party. Bookmark the permalink.